I guess what I'm saying is that by all accounts, his genius was the equal of Gielgud and Olivier but he is rarely spoken of in the same breath or placed in the same class as them. I am suspecting that maybe this is due to something like: perhaps he ceased stage work and concentrated solely on movies whereas they did not? That jibes with what I've read. Thanks. 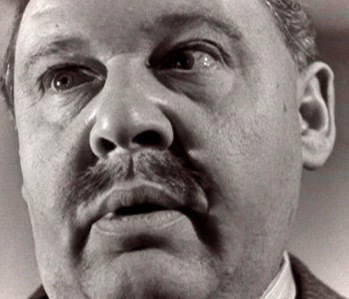 But just as often as I've heard about Laughton's perfectionism, do I hear mention of his 'hamminess'. I think its a terrible accusation in that its too subjectively applied. His 'Hunchback' for instance; how to underplay that to any better result? Its a role which is justifiably celebrated, I should think. Yeah, I think there's an art to "over the top" more broadly played characters. 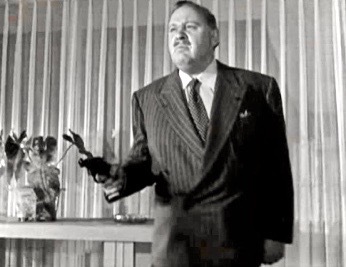 Even in Laughton's most outrageous mannerisms there is still a pensiveness and a droll quality, suggesting he's in on the joke, exposing the pomposity and the sheer ridiculous of a character with intelligent exaggeration. It's interesting you mention his role in THE HUNCHBACK OF NOTRE DAME. 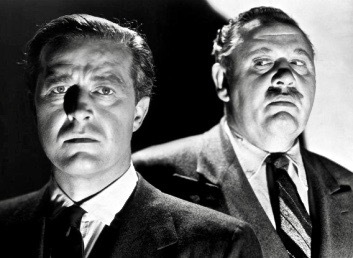 Earlier today I watched THE BIG CLOCK (1948) which I will be reviewing next weekend. As I took notes, I had to pause the movie so I could get a few thoughts jotted down before going on to the next part.  And when I looked up from what I was writing, I realized I had paused the film on a frame where he hunches his back over in an office scene that very much resembled his earlier portrayal of Quasimodo. I think he likes to allude to the grotesqueness of other characters when he is playing a "newer villain." A lot of his work requires repeat viewings, because if you get too caught up in the story, it's easy to miss his techniques as an actor. Aye, I was astounded watching his Quasimodo for the first time. Felt it was a performance for the ages; a performance against which all film acting might well be judged. Of course I am not very well-versed in Shakespeare so I can't really say this with any authority. I know that its usually Shakespearian roles like Richard III, Henry V, Lear; Othello, Iago, and Hamlet which are usually considered the chops for great actors. 'The Big Clock' by poet Stephen Spender is a lot of fun. I like the Greek allegory. I've heard the principal cast reprise all their roles in a radio version too; "Actor's Playhouse" hosted by Cecil b DeMille or some such. Not sure if we need to compare him to other actors or those who excelled in Shakespearean classics. If his work resonates with you and you respect what he puts on screen, then that's enough. Well its not that my opinion would increase or decrease based on what anyone else might say ...but I usually do want to understand the context into which my reaction to a work, falls. Is my impression more --or less--extreme than the norm? Its usually interesting to explore this kind of thing. Anyway here's my favorite Vermeer. Can an actor perform "properly" by only playing royal figures and men of great standing? Or can he be just as masterly portraying a beggar painter like Rembrandt van Rijn? ... and he did go on to play the Hunchback of Notre Dame and direct the one-of-its-kind NIGHT OF THE HUNTER. Nobody could accuse Laughton of typecasting himself. What impresses me about this biopic, apart from Laughton's performance and one of the few noteworthy Gertrude Lawrence appearances on film, are the set designs and costumes. 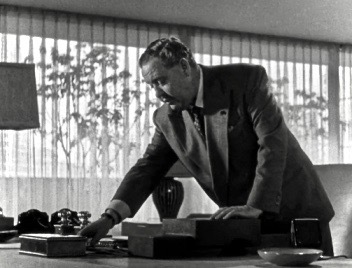 Vincent Korda, brother of the director/producer, and Hal Waller get much of the screen credit while cinematographer Georges Périnals makes sure the stylized floor patterns get showcased a lot in addition to the boxy windows and door frames that suggest the way an artist's life is sometimes confined by the frames bordering his masterpieces... or, rather, the public tries to confine him by their own frames. There is an interesting tradition among movie biographies to tailor the backgrounds to fit the psychological state of the subject. Note the scene when the well-to-do crowd reacts negatively to one of his paintings, which does not “conform” to all of the squares in the floor tiles, flags and striped ceiling arches. Mentioning both REMBRANDT and KINSEY in the same post had me thinking of movie biopics in general. Likely 80% of these are highly inaccurate, compared to a published book that uses verified sources and interviews and doesn't compromise simply to entertain a theater or TV audience. Nonetheless, they are still a most engrossing genre. Also they reflect the times they were made more so than the past periods they depict. REMBRANDT was, in fact, made during a boom period for biopics in the mid thirties, culminating with two back to back Best Pictures: MGM's THE GREAT ZIEGFELD (even if the emphasis was on the dazzling musical numbers) and Warner Brothers' THE LIFE OF EMILE ZOLA. I find REMBRANDT more entertaining than those two, but I still love Paul Muni in his role in the latter too, also including his take on Louis Pasteur. We can add Edward G. Robinson in DR. EHRLICH'S MAGIC BULLET and James Cagney in YANKEE DOODLE DANDY, among others, since Warners was the best studio for this genre. I think the failure that 20th Century Fox had with WILSON (at least partly due to its timing since nobody was motivated by a deceased pacifist president during the same summer as D-Day) probably halted this biopic infatuation that Hollywood had for roughly a decade. 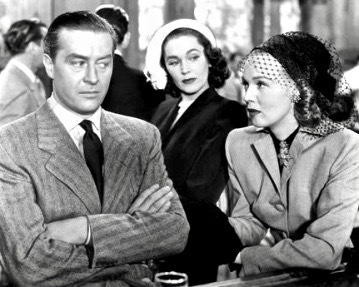 Most of the post-war and fifties biographies covered musical performers and songwriters (like THE GREAT ZIEGFELD and YANKEE DOODLE DANDY previously) so that the focus could be on the performers doing familiar melodies on screen. The sixties saw the next big biopic boom, but often with figures who were the “rebels” of an earlier era whom the burgeoning teen market could relate to. Obviously the earlier QUEEN CHRISTINA and THE SCARLET EMPRESS are enjoyed more as Garbo and Dietrich vehicles, which is why the Catherine the Great biopic put out by REMBRANDT's Alexander Korda's is less famous today (being contemporary of THE SCARLET EMPRESS). I especially love QUEEN CHRISTINA because it reunited John Gilbert with Greta, who was never going to be tied down by any man just as Christina would not be tied down by Swedish traditions... regardless of the sexual chemistry they once had. She enjoys herself enough just exploring the “essence” of the room she shares with Gilbert, remembering the great times they had together making FLESH AND THE DEVIL. She may ultimately leave the throne for him, but remember that Greta is still... alone... at the end of it. Hair blowing in the wrong direction from where the boat is sailing. GANDHI does resemble something made for British TV in the late seventies and early eighties with Ben Kingsley still looking like Ben Kingsley and Candice Bergen looking nothing like Margaret Bourke-White, but it presents history coming to life on the same epic scale as David Lean's earlier LAWRENCE OF ARABIA and is a delightful homage to that and all other stately biopics that came before. Richard Attenborough was a fan of the old newsreels, incorporated most effectively in one or two scenes, and newsreels were being re-evaluated in the late seventies and early eighties by mainstream film historians (also note the nostalgic Australian NEWSFRONT made earlier in 1978) with much less criticism regarding how they presented the news “in black and white”. It all makes for wonderful nostalgia, being a movie biopic that wants to be an entertaining movie and accepts itself as one, rather than try to be a detail-by-detail account of a once living person. I had some problems with THE KING'S SPEECH because it was trying to be more factual, but still took notable liberties (like condensing his speech therapy to just a few short years rather than over a decade as in reality) while THE IRON LADY may have downsized Thatcher's importance by focusing too much on her dementia of later years. I do enjoy THE QUEEN with Helen Mirren since it focused on just a few weeks in one's life and how she copes with it. Gus Van Sant's MILK pretty much got it right, fact-wise, probably because the 1984 documentary THE TIMES OF HARVEY MILK was so widely seen for decades prior to 2008 that any dramatization of his life would get nitpicked. What was interesting about that one was how immersed we see the lead in The Cause, much like Martin Luther King and others fighting for social equality, that he suffered in his personal relationships. One ex boyfriend does show him later how proud he is for all of his political efforts despite their breakup years earlier while another commits suicide. Intriguingly, the screen is filled with multiple people in the same shots than just one face, reflecting how difficult it was for individuals to be completely alone with Milk. He also was portrayed by Sean Penn as one who was not always practical in his crusade; for example, just telling everybody to “come out” of the closet isn't going to make their lives better since families and employers in the 1970s would instantly reject them permanently and most would be in the streets. The opera “tragedy” angle that was used here was interesting, even it too involved some liberties with truth; it works better as screen entertainment to show him dying to the bullet as he looks at a marquee billboard. 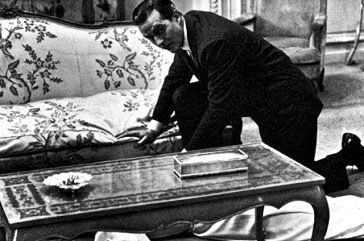 There is an interesting tradition among movie biographies to tailor the backgrounds to fit the psychological state of the subject. I think this is an insightful comment, and it's something I hadn't considered before. We should also point out that some biopics are less explicit. 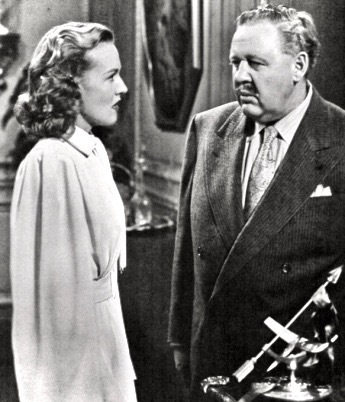 In THE BIG CLOCK (1948), which I will review next weekend, Charles Laughton's character Earl Janoth is based on Henry Luce. 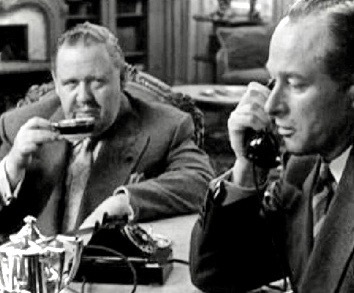 And of course Charles Foster Kane in CITIZEN KANE (1941) is a character that draws inspiration from William Randolph Hearst. 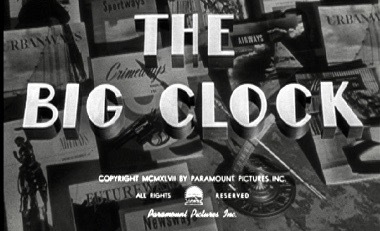 I will be doing a two-part review for THE BIG CLOCK (1948) since I wanted to cover the story and many of its key scenes in greater detail than usual. I will post Part 1 on Friday evening, and then Part 2 on Saturday morning. Note the scene when the well-to-do crowd reacts negatively to one of his paintings, which does not “conform” to all of the squares in the floor tiles, flags and striped ceiling arches. I'm trying to recall exactly why these burghers so disliked Rembrandt's dark, smoky, works. The still posted by jlewis, makes me recall the Protestant antipathy to images and iconography (similar to Islam) and as a result going in for geometry and ornament. But Rembrandt's stuff is still powerful nonetheless. Was it mentioned in the movie why they disliked his style? It's just not as clear a divide as say, the French neo-classic salons' revulsion at Impressionism. They thought the painting was too dark, too confusing. Rembrandt lashes out at them and calls them unlikable people, implying that he couldn't help but include some of their more unlikable traits in the portrait, in order for it to be authentic. It was 36 hours and 25 minutes earlier when a guard gave a tour of the facility, telling people the mammoth clock cost Earl Janoth (Charles Laughton) $600,000. It can tell time anywhere in the world. We learn Janoth is a publishing magnate, not unlike Henry Luce, the publisher of Time, Life, Fortune and Sports Illustrated. Janoth's mags are all branded with the word 'Ways.' And George Stroud is in charge of Crime Ways, a magazine which aims to solve cases before the police do. Stroud and Janoth have a prickly relationship; Stroud doesn't like the demands Janoth puts on his time, even if the money is good, while Janoth is threatened by Stroud's intelligence. The relationship of the two men is revealed in the elevator, and when Stroud arrives at his office. We glimpse Stroud's corporate surroundings, as well as a lavish executive suite commandeered by Janoth. A meeting gets underway, and Janoth wastes no time docking a custodian's pay and firing a printer who doesn't use the right color ink. He is not a man to be messed with! Laughton plays Janoth wryly. At one point he calls his men chuckleheads, and he seems to enjoy lording power over them. The sets are spacious, the men are all immaculately groomed, everything is clean and perfect looking. After the meeting Janoth's mistress Pauline York (Rita Johnson) turns up. He gives her a check with a promise to see her tomorrow night. Meanwhile George learns his vacation was cancelled, because Janoth is disallowing any time off. At lunch George bumps into Pauline at a local bar. They are acquainted and discuss Janoth, until George's wife Georgette (Maureen O'Sullivan) arrives. Georgette feels George is married to his job more than to her. Typical insecure wife stuff. George says his vacation was cancelled but he's still going to take Georgette and their son on a trip and Janoth can deal with it. In some ways the story is reminiscent of PATTERNS, where the talented executive and his wife have to adjust their lives according to the whims of the head boss. But unlike Everette Sloane in the later film, Charles Laughton gives us a much more cultured tyrant. It is also suggested that Janoth may be homosexual and uses the mistress as a beard. During many of these scenes there are references to the clock, how Janoth owns their time. The clock motif takes on other meanings as the story continues. Especially with regards to the mistress, Pauline York. The next part involves George being sacked by Janoth for not postponing his vacation. George returns to the bar he had lunch at earlier and again meets Pauline. They're rebelling against Janoth, no longer will they be enslaved by him. George misses his train home and goes club hopping with Pauline. At one point they're on a sidewalk and end up near an antiques shop. They go inside and meet a female painter named Louise Patterson (Elsa Lanchester). 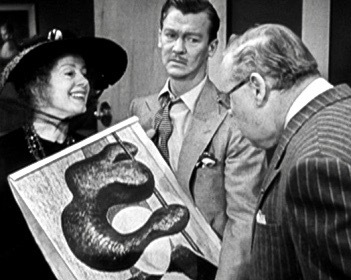 She shows them a portrait she did and compares herself to Rembrandt, an inside joke. George buys the painting and takes it with him as he and Pauline go to another bar. They've also picked up a sundial. There's a montage that shows Janoth waiting to meet Pauline, while George's wife is wondering where he is, so they can begin their vacation. We see that George has become so drunk, he ends up sleeping it off at Pauline's upscale apartment. But then Janoth arrives unexpectedly, and he has to hurry out of there with his hangover. He takes the painting with him but leaves the sundial behind. Janoth fights with Pauline about who they spend their time with when they're not together. He has seen George's shadow leaving down the stairwell. She references his relationship with a male executive named Steve (George Macready) and calls him a disgusting man. Janoth ends up grabbing the metallic sundial and clobbers her with it in a moment of rage. He's killed her instantly. Apparently her time was up. Coming up in Part 2...Janoth covers his tracks, and George gets drawn into investigating Pauline's murder. I admire the fun simplicity of the tale right up to the part where 'murder-most-foul' transpires. It develops nicely, the Grecian motif of the entire project: in Greek myths there is often exactly this same kind of thing going on. Breathy, lust-tinted, naughty Gods and Goddesses always scurrying around various places in Earth and in the Heavens, cloaking themselves, disguising themselves, ducking behind clouds and trees and waterfalls. Always trying to keep out of sight of Zeus or Hera. Zeus and Hera of course, although very powerful were are not the ultimate hypocrites for remember they are but children of the earlier Gods like...Rhea and Cronos; who were even more stern and demanding. Well at least Cronos was. There were other gods too like Chaos and Nemesis and Abyss(? can't recall) from which even the cheaper Gods (the squabbling soap-opera panoply under Zeus) all shrank. So I'm not sure but that either Stephen Spender is mixing his allusions here or extending his loop a little wide; if Janoth is supposed to be Cronos (making the most sense) then Stroud would be Zeus? That doesn't work. The other cast fit in nicely with figures like Mercury and Hephaestus, Stroud's wife or Janoth's mistress could be Venus, who knows. The chief fun comes from seeing 'time' and 'punctuality' used as a means of control and having that perfectionism reflected back on and distilled into a personality like Janoth's. This is a classic aspect of the Greek world and I'm sure in Spender's hands, it was fully developed in the novel from which the movie was adapted. Is Henry Luce the husband of Clare Booth Luce? Seem to recall as such. Oh well. Swell review so far...bravo...! p.s. another thought is that the flick is well-removed from being merely a 'newspaper noir'. As some wags around here have been wont to assert! But nay. Even a cursory glance at the provenance and the structure of the yarn, places such an idea beyond credible consideration. The story-models Spender draws on for his nifty romp are ancient. As a poet, he is plainly paying an amusing homage to motifs he knows so well. Now, you can say a lot about Greek myths: they're fantasies, they're adventures, they're romances. They're religion, they're allegory, they're exoterica. There's a wealth of study they afford. But for anyone to simply 'boil them down' into something like "they're possible noir influences" ...all to support the argument that 'Big Clock' is still a noir even if it is clearly a Greek model in structure ...this would be zany. I can just imagine that old rouee', (Uncle Joe), incorrigible rapscallion--doing so, were he present in this thread at this moment. But he's wrong. Stories come down to us from a myriad of other historical sources and cultures other than the pulp tradition which informs so much of our own literature. 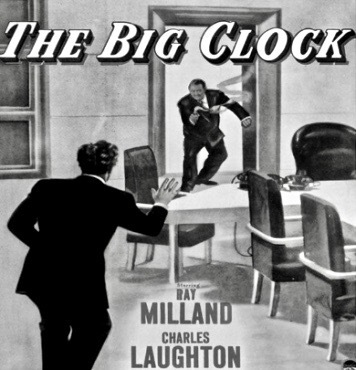 We should just treat 'Big Clock' as we have treated other, straightforward works of mid-century pop lit; and not invest it with anything it does not originally possess. If anyone detects 'noir flavor' in a Greek myth it is not because Ovid was a fan of pulpyrus. (leetle joke I make there, n'esce pas? You see? ha). Anyway no, the slight noirishness in 'Big Clock' just means that Spender uses the very common and natural theatrical element of dramatic tension. Tightening a loop around your protagonist is the age-old recourse of storytellers from time immemorial. Its automatic. Some of the commentaries I've read complain that THE BIG CLOCK has too much humor in it. How it is not a "real noir" because it angles towards comedy too much. But I think a story can be dark and satirical. 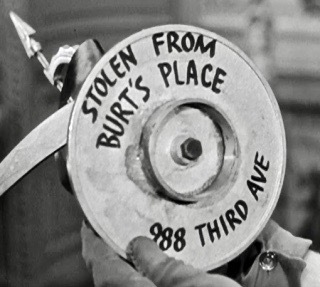 Who says film noir can't have funny scenes? Probably the comedic elements come more from Laughton and Lanchester, especially her. I don't recall Milland saying anything extremely funny in the movie. O'Sullivan plays her part straight, and Johnson as the murder victim is certainly not comical in any way. Who says film noir can't have funny scenes? Our 'guts' say so, isn't that the answer? What we feel. How we respond emotionally. Isn't a deep, rollicking belly-laugh more powerful than a mere titter, 'cracking a slight smile' or 'turning up the corners of one's mouth'? Wasn't the terror of Spielberg's "Jaws" something that proved beyond any doubt, the differences between mild 'tension' ...and riveting, petrified fright? When you're literally gripping your arm-rests with white-knuckles during a film, its not the same thing as slurping RC cola and munching popcorn, idly absorbing a Richard Benjamin movie. Sure, superficially you can mix any two genres together ...but how effective is the end-result? Isn't the goal of movie-going, for us all to undergo sweeping, overwhelming emotion? Aren't we supposed to emerge from a theater quivering and shaking? And does comedy-noir provide that? Since comedy releases tension and noir builds tension, I think they two naturally counteract each other. How many people recall experiencing vivid emotion while watching John Frankenheimer's comedy-noir, "99 & 44 100% Dead"? How many of us are 'moved' by watching George Segal in 'The Black Bird' (comedy-noir sequel to 'Maltese Falcon')? Think of it this way, maybe. 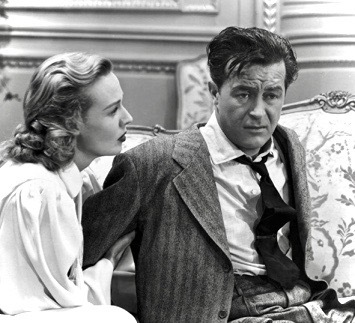 Take an audience full of people, sit them down to watch a hard-hitting noir ('Detour') and then sit them down to watch a mixture of comedy and noir ('Big Clock'). If each audience member was somehow hooked up to an EEG machine to read their brain waves during the film, you'd see the needles leap off the scale ....during a really icy, brutal noir. Whereas a comedy-noir would leave viewers relatively unruffled. Light comedies are just ...a light, pleasant, way-to-"pass-the-time". Nothing wrong with that, but its just ...well...."not the same". Since I've been on this site I don't think I've yet mentioned some of the movie-going experiences I've enjoyed at my repertoire theatre in Manhattan, typically where I go to see classics on the big screen. Now, I'm a Sean Connery fan. One time, I specifically traveled across town to this theater specifically to enjoy one of my favorite Sidney Lumet flicks, the Cannes winner from 1965, starring Connery in perhaps his career-best performance. I'd only ever seen it once before, on a small 13" Sony TV in my kitchen. So I was really looking forward to it. Its just the kind of flick I admire: taut, gritty, based on a stage play; a story emphasizing acting skills above all. Okay so I attend the film that evening and enjoyed the heck out of it. Love it. Maximum entertainment. Now --at the end of the film--not sure if you're familiar with it--the performances of (the great) Ian Bannen, Ian Hendry, Sean Connery, and especially Harry Andrews race up to a livid, frenzied, nail-biting climax. Performances are furious, the actors shouting at each other while literally standing only inches apart. Roaring, chaotic, catharsis. The screen finally fades to black ...the movie was over. But what followed? Nothing. Utter rapt stillness. Frozen shock. No one in the whole theater --at least sixty people--no one even moved from their chair. No one rose to get up. No one reached for their purse or their coat. Nobody said anything; no one breathed a damn word. No one moved a muscle. We all just sat there, stunned into silence. Many had wet faces, I know I did. Some women were sniffling. And this lasted...maybe ninety seconds or two minutes. In the modern-day hustle-bustle of New York, for anyone to sit still 'not doing anything' for two minutes is unheard of. It just doesn't happen. This is why I say there's a big difference between (say), 'Detour' and 'just passing the time with a movie'. People limped out of that theater that night. Yeah--I'm a purist! I don't think putting two or more genres together in a film is superficial. Sometimes it's done because the story has characters that display different attitudes about a situation, and an attitude might be silly (like the woman Elsa Lanchester is playing in THE BIG CLOCK). Other times the producers and directors are intentionally combining genres so the film defies classification and appeals to a broader audience. A dramatic film that has comedy scenes is not necessarily compromising its value in any way. We don't have to emerge from the theater "quivering or shaking" every time. We just have to experience a variety of emotions. And some of those emotions might be the kind Laughton and Lanchester make us feel in THE BIG CLOCK. We just have to experience a variety of emotions. Some movies are designed to have the same effect as an aquarium. That's a whole other discussion. In a moment of blinding rage Earl Janoth has clobbered his mistress Pauline York over the head with a metallic sundial. He didn't go there with the intention of killing her, but she had intimated he was a dirty pig, and it angered him. Now she's dead on the floor, and no amout of wishing is going to bring her back. He quickly leaves her posh apartment and returns to his office. Janoth tries to gather his thoughts and decide what to do. His crony Steve Hagen visits and learns what Janoth has done. Janoth describes the murder. Then he says how in his haste to vacate the premises, he had left the sundial behind along with his hat. Steve is always eager to please Janoth, and he tells his boss not to worry. He will take care of it. It is an odd but charming sort of confessional scene. And Laughton and Macready bring a strange sort merriment to the proceedings. In their minds, murder is just a little mess you can clean up. Steve takes the sundial with him and beats it back to Janoth's headquarters. We then cut to George who is now with his wife and son on their vacation. They discuss the fact that Janoth is going to blacklist him. 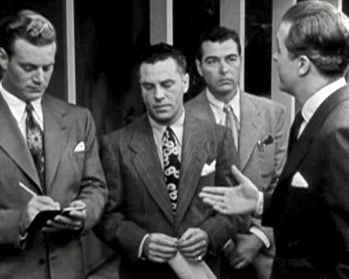 The word 'blacklist' is used on camera, which is interesting given that in 1948, members of the Hollywood community were starting to be blacklisted. The phone then rings, and it's Steve calling for Janoth, to get George to come back to work. Pauline's murder is mentioned. George feels a sense of responsibility to find out who killed her. Ironically, he does not know Janoth is the culprit, and Janoth doesn't know he was the other man at the apartment last night. The next day George is back on the job, and he's gone to Pauline's place to snoop around for clues. We also see Janoth's manservant Bill Womack (Harry Morgan) giving him a massage, and Janoth casually discusses murder with him. Morgan has no dialogue, but his expressions speak volumes. This is an intricately plotted noir with many well-defined characters, portrayed by a group of skilled actors. 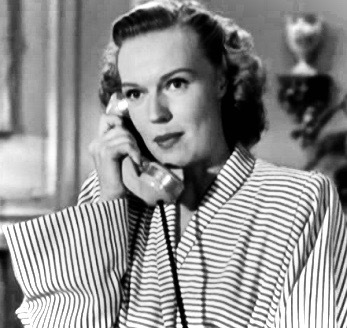 It should be pointed out that Maureen O'Sullivan was the wife of the film's director (John Farrow); and of course, Laughton and Lanchester were married. Anyway, on with the rest of the story. When George returns to Janoth Publications, he assembles a group of men to go over what he likes to call "irrelevant clues" that might mean something and lead them to the killer. One of the clues involves the painting that Janoth had seen the other man carrying when he fled Pauline's apartment. With Steve's help Janoth intends to pin the death on the other man, still unaware that man is actually George. By this point George knows how deeply implicated he is in all this, but he sends a reporter to speak to Louise Patterson the artist. 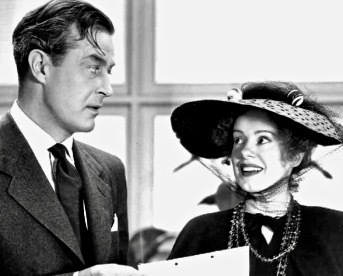 The scene with Lanchester and the reporter is highly amusing, and we learn some of her history. Though Farrow's the director, it feels like Laughton is directing his wife, giving her suggestions to be over the top yet droll. 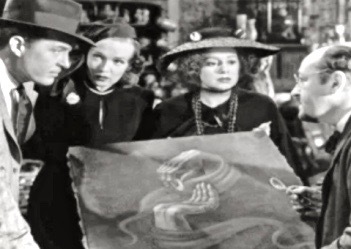 She's equally hilarious in a later scene when she makes a sketch for George of the man she saw at the antiques shop, knowing of course the man was him. Louise believes George isn't guilty of anything. For a tidy sum of $500, she will sketch a different figure. So while Janoth and Steve are perverting the course of justice, we also have George and Louise manipulating the situation to keep an innocent man from being railroaded. Meanwhile Janoth has organized a floor by floor search of his building, when a tip comes in that the killer was recently seen entering Janoth Publications. At the same time Louise has just completed her sketch. This is when we finally get a scene between Laughton and Lanchester. It turns out she did an abstract, to conceal George's identity. Janoth's reaction is priceless. It's a hilarious moment, one of the comic highlights of the film. Lanchester clearly steals every scene in which she appears. In the background more witnesses have come forward, though some of their descriptions are wildly off base. Georgette shows up to help George, who now realizes Janoth is the one responsible for Pauline's demise. George thinks his only way out is to pin the murder on Steve, who had gone to the scene of the crime. He is counting on Janoth to turn against Steve. 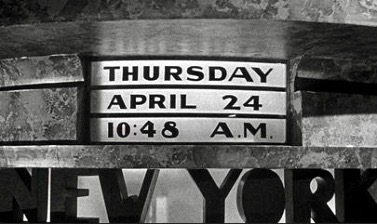 In order to buy time, George goes into a central room behind the big clock. 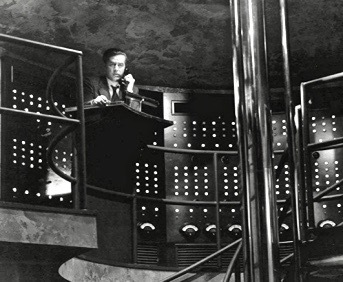 He makes a call then turns off a power switch, symbolically stopping time. Meanwhile the manservant and Steve have been following George's movements. George returns to the executive suite and knowing that Steve's in an elevator coming up, he does something to the elevator door to stall the elevator. He leaves the elevator door slightly open, but the elevator car is down below several floors. We then have an important scene where a police inspector shows up, and George and his wife trick Janoth into selling Steve down the river. Steve has now joined them, but he says he did not kill Pauline and names Janoth as the murderer. He will testify to this in court. Janoth then pulls out a gun. The last part of the film is very climactic, and it plays quickly. After Janoth pulls out the gun, his guilt is confirmed. He shoots Steve, then takes off. He heads into the outer office, where he intends to get the elevator. He sees the door open and goes to get inside, but the car is still below, and he falls down the shaft several stories to his death. It's a memorable ending for one of Laughton's more grotesque villains. The details of the plot, I can't say I admired all that much even during the viewing of the flick. There's some corniness--the unlikelihood of being able to 'fix' an elevator shaft demise for the villain, for example. The breathlessness of the tale is all about the god-like figure of Janoth & his mighty clock which runs everyone's lives; and Janoth sending his various lackeys and henchmen to scour the giant skyscraper (Mt Olympus) for the 'guilty' man he himself has framed. That's gripping. How does one escape a building when security guards are checking everyone's identity? There's a nice irony here too on modern media's power to indict a suspect without a fair trial. Which is what Janoth's magazine "Crime Ways" excels in. In terms of Janoth's character and Laughton's characterization, I love how Janoth is constantly issuing orders and saying "do it NOW! ", "Start immediately!" (or otherwise stipulating to-the-minute instructions). 'Get this done by such-and-such a time', 'report back to me at such-and-such a time', etc. Hilarious. Its true that when you control people's time, you control them. I wonder if Spender had some Leftist inspiration for this story.